Christoph Wachter & Mathias Jud present Landung in Australien, an exhibition that explores the complexities surrounding refugee and asylum seeker policies within the context of Australian national law. We experience nowadays a shrinking world with simultaneous communication and borderless travel options. The continents get closer, cultures meet, and goods and people can constantly exchange. At the same time worlds drift apart between those who are privileged with civil rights and residence permits, and those who are excluded and suppressed. The lives of those who came by boat – of those men, women and children in indefinite, mandatory detention – lies completely in the hands of the Australian authorities. What they eat, what they read, when and with whom they can speak – all this is consistently determined by the authorities of Australia, the same country they shall never reach. Dramatic escapes and traumatic boat odysseys continue in pointless undetermined detention. Who ever has the choice of travel opportunities would never undertake a life-threatening non seaworthy boat. Horrifying experiences that can hardly be conveyed are extended in detention, in a limbo whose only purpose is to use these people’s existence in this place as a deterrence for others. Here, it remains to reconstruct exactly what the current world characterises: the shortening of distances, the approximation, the options for connections. It is about finding a link and making a connection despite censorship and upheavals. In the forming of connections lies also the option to learn something about actual underlying power conditions. We might establish connections, that open insights and work as bridges over specific, contrary horizons of experience and beyond a divided world and power political segmentation. These connections are complex not only because certain forms of communication are prohibited in detention: differences also stem from cultural and individual forms of expression, and may result in the forming of a political meaning. But in dire situations it touches even more crucial possibilities: to appear as human beings and to receive social attention. This attention is existential, because it decides whether survival is possible or whether humans are left sinking in forced neglect and disclosure. It involves the necessity to be able to transmit a sign of life and to appear on the surface, as persecuted, threatened and marginalised voices and not to be drowned as a deposit in a power political and geopolitical whirl. To be recognised and perceived as life depends on not going down, whether on the open sea or in the whirl of power political debates. Wachter and Jud entered Australia with an eVisitor (subclass 651) visa. Landung in Australien showcases the outcomes of a 9-week research project held with the QUT Creative Industries Precinct as part of Move On: European Media Artists in Residence Exchange (EMARE). The QUT Precincts would like to officially welcome Christoph Wachter & Mathias Jud to the Creative Industries Precinct residency space at Kelvin Grove. Hailing from Germany, Wachter and Jud are currently working onsite at the Creative Industries Precinct developing their project, Landung in Australien, which aims to explore the current stories, issues and policy surrounding refugees and illegal immigration in Australia. Wachter and Jud are working collaboratively on extended research into current refugee policy, and the lack of communication and the isolation that surrounds asylum seeker detainees. Through their work, Wachter and Jud aim to consider an expanded dialogue that attempts to hear the voices of people living in detention, including the currently excluded perspectives on this complex humanitarian issue. Christoph Wachter & Mathias Jud have worked together on participatory community projects since 2000 and their collaboration fuses art, science and technology. The duo have received numerous international awards and accolades from Ars Electronica, Transmediale, the Saxon State Ministry for Science and the Arts, and the Swiss Federal Office of Culture just to name a few. Wachter and Jud will reveal their research outcomes during their Landung in Australien residency exhibition. The opening night event of this exhibition will be held on the 31st of March at The Block, QUT Creative Industries Precinct, Kelvin Grove. Landung in Australien is a 9-week research project as part of Move On: European Media Artists in Residence Exchange (EMARE). A big congratulations to Monica Rikic, one of our 2014 artists-in-residence, who has been nominated for the 2015 Guthman Musical Instrument Competition. Monica was recognised for her project, Buildacode, which she developed during her residency with The Cube last year. The competition celebrates pushing musical boundries, and challenging the way instruments and music have traditionally worked. Monica is among 20 semifinalists to receive international recognition for out-of-the-box musical creations. Instruments from this year’s semifinalists range from sculptable interfaces to the Space Age string instrument, the Yaybahar. Keep an eye out for those colourful cubes – they will be showcased in the coming months and at Robotronica in August this year. Buildacode – Tangible Sound Programming from Mónica Rikić on Vimeo. Designed by The Cube’s artist-in-residence, Mónica Rikić, Buildacode was showcased to the public for the very first time over the weekend. 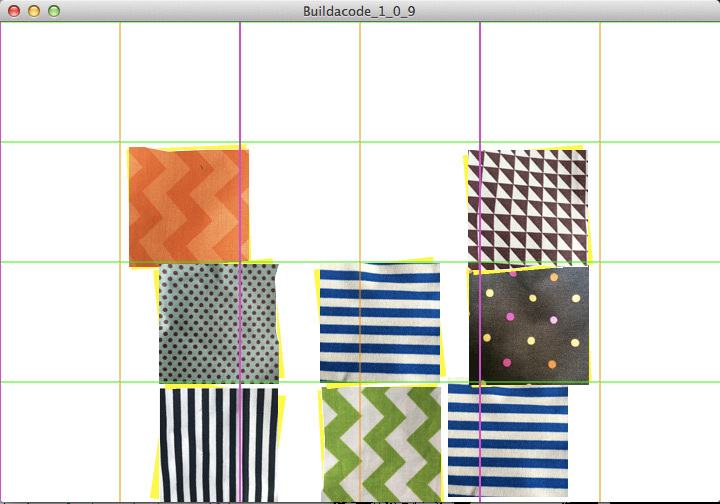 Buildacode is an experimental tool for sound programming, which seeks the integration of objects’ manipulation into a visual programming environment for real-time sound creation. 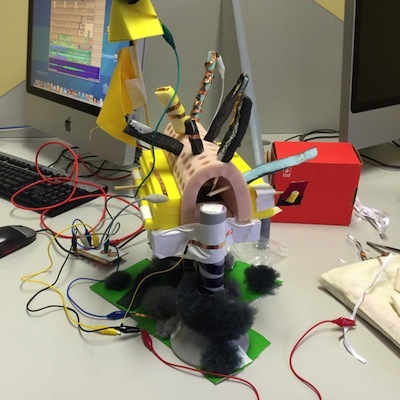 The project aims to allow people with or without previous programming knowledge to enjoy tangible sound coding through the manipulation of friendly objects. Buildacode does this by using 24 colourfully decorated foam cubes of 25cm³ each. By building different figures and shapes with the cubes, users can play with different sounds and compositions. Watch the final project here and stay tuned for upcoming opportunities to interact with the project! Move On – New Media Art from Australia, Canada and Europe / EMARE Australia Canada is supported by the Culture 2013 program of the European Commission and the Goethe-Institut. 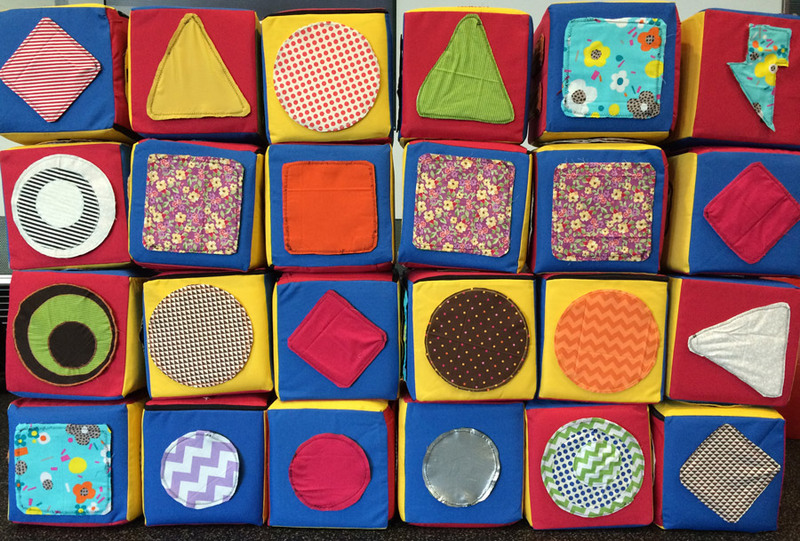 The Cube’s Artist-In-Residence, Mónica Rikić, talks about how difficult it can be to get velcro in Australia, and shares some pictures from her last workshop at The Cube. When I did the material list for the project I was pretty sure that everyting was easy to find, except from the fact that we are in Australia and I’ve just discovered that things are a bit more difficult to find here. So after a week of finding a way of printing the Fiducials on the covers, then finding an inkjet printer (mission quite impossible nowadays really!! ), running out of ink, printing the transfers, the transfers stopped working, going to the shop again, complain and get them changed, print them again and ironing 72 different ones, I was ready to do the patches. We thought it would be a good idea to stick them with velcro instead of sewing them directly to the covers. This way, if the cubes or the project want to be adapted for other purposes it’ll be much easier. Then we entered in the incredible world of verlcro: hook, hook & loop, stick in, iron in, sew in, 12mm, 20mm, 25mm, black, white, cut in circles – doesn’t matter which one you choose, all of them are way too expensive!!! And that is how I got my velcro finally. After that my laptop charger broke, the puppetry workshop material took ages to arrive, it’s been very difficult to get the right place to test because everything seems to be full booked and I only have two weeks to go. But it’s all good, without these little problems life wouldn’t be as exciting as it is, and for me the project is really worth it!! Finally, the cubes are done! 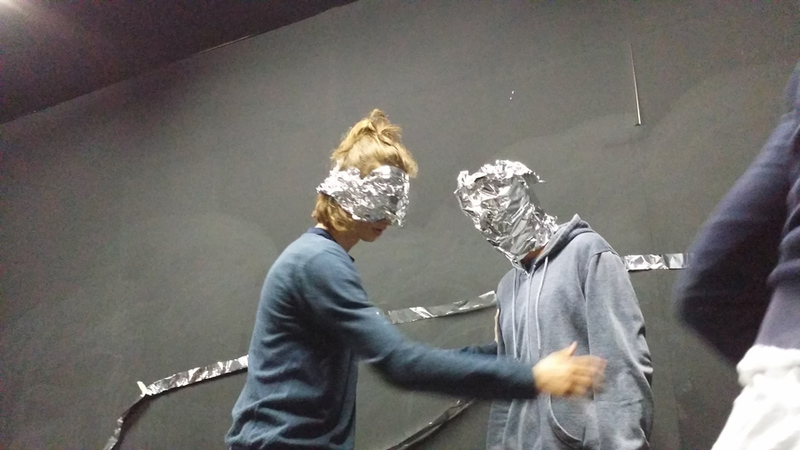 I think that this next picture just shows the whole feeling of yesterday’s puppetry workshop. Once again, amazing kids, amazing job! 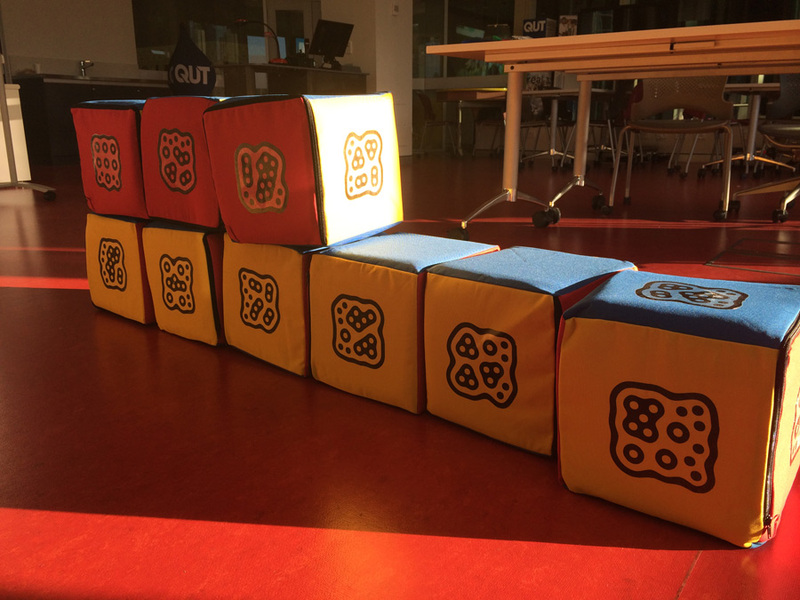 Artist-in-Residence Mónica Rikić tests out the Buildacode cubes, and shares about her time at the Garduino and Makey Makey workshops. I’m planning to do a first test with kids on Saturday next week so I have to work very hard in order to get as much as I can done by then. I finally managed to get the transfers done in the cubes – believe me, it wasn’t easy – and almost all the patches are ready, except for some that I still have to decide, and I’m just waiting for the velcro to arrive so I can attach them to the covers. The first test has lead me to some conclusions that I didn’t think about before. For this version of the project, for example, the space will be reduced to fit the 24 cubes in scene and no more like before. Some of the interactions I was thinking about didn’t work as well as I expected so I was able to correct them and make them easier and simpler, which will make not only my job easier, but will improve users’ understanding of the project. I almost have all the MIDI part of the project ready. Next week I’ll be working with the synthesizer side of the project! For me it’s the best bit but I know that I have to make it easier so the kids understand and enjoy it! Another bit I’ve been working on this week is the visual feedback. It’ll help the users to understand what they’re doing and it’ll also be very useful to deliver workshops to teach music principles and programming, which is one of my main goals in the project. I’m working around getting the same style the patches of the cubes have so it’s easy to relate. I still have to decide if I’ll put some text in the cubes’ visual feedback, but I’m pretty sure I will in some of them so I don’t have to give much further instruction. This weekend I gave the Garduino workshop for making musical instruments with plants. I was really looking forward to delivering this workshop. Although the weather was horrible on Saturday, I had seven cute little kids join the workshop. I was pretty amazed by how many things they already knew, particularly those children who often attend activities at The Cube. I’m actually a bit jealous I have to say!!! How I wish I could have had access to a place like this with all these workshops and learning facilities… And also how I wish new technologies would’ve been as accessible as they are now back when I was a kid!! I hope those kids are able to appreciate this at the same time they enjoy as much as they do! 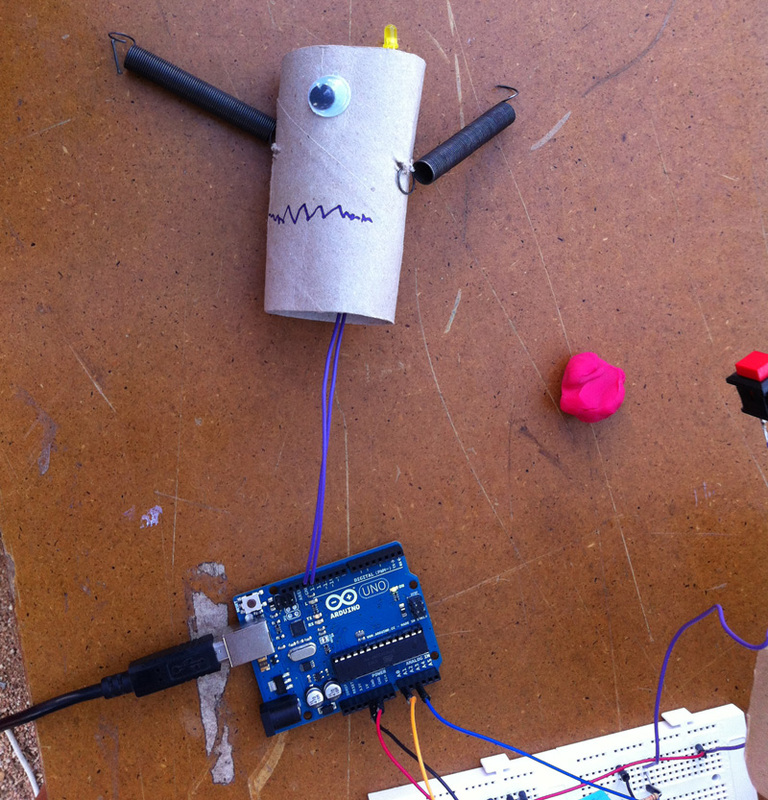 And to finish, I’d like to thank all the Visual Art students I had during the three Makey Makey workshops I delivered. I’m very impressed by their dedication and engagement. I hope I’ve been able to open a little door – or window – to a new world of possibilities for them the same way new tech did to me as an art student. Thanks very much for all the respect and attention they’ve all had and for making me feel as happy as I feel now! Great experience! 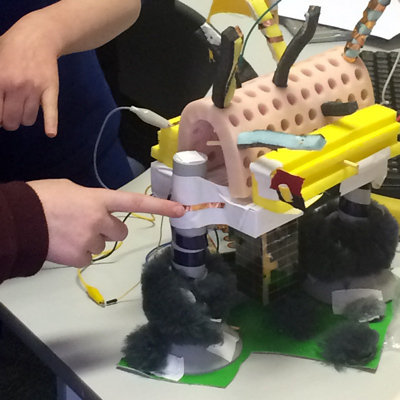 Here’s one last image of a project one group of the Visual Art students did at the Makey Makey workshop. The Cube’s Artist-In-Residence, Mónica Rikić, talks about new updates in Buildacode, the GAME ON Symposium, and Visual Art student workshops. Mónica: Last week has been quite busy! I’m now halfway through my residency and I have to be 100% hands on with the project. All the basic functions of the code are finished and I’m preparing the physical part of the project, which means that I’ll be cutting and sewing for the rest of the week 🙂 . It’s actually quite nice to have to be away from the computer and still feel I’m working hard on the project. The whole point of the project is to get out of the screen and learn sound and coding basics, so it feels very good to experience it in the process too! It feels like the right thing to do! I almost have all the drawings/patches done, there’s some that I’ll decide when I do the live tests since I need to check that my ideas are working correctly. I’m happy to have Jeniffer Heng to help me with the sewing and the testing, I’m sure she’ll give me good advice! Also, I’ll be doing a two-day Masterclass focusing on education and art students the last week of August and the first of September, where I’ll be talking about my research and new ways of teaching new technologies through new technologies themselves. I’m sure some really good advice will come out of working with the students around the project. Better teamwork than lonely work! Like Zach Lieberman said last week in his talk at The Cube, it’s time to go from DIY to DIWO (do it with others!). So last week’s highlight was definitely the GAME ON Symposium organised by my beloved Truna. It was a weekend of interesting talks and workshops around gaming and the games industry. There was this amazing showcase of home grown games that was full most of the day, which means succes! Congratulations to Truna, Lubi and the rest of the team for the event! I went to Zach Lieberman’s Openframeworks workshop on Sunday. Although we didn’t really actually code anything, it was very interesting to talk about the structure of Openframeworks, see some exercises and go through the code to understand the process that was happening and how to create a project – good start. I was very surprised with the motivation of both groups during the workshop. At the end of the workshop they had to show what they’ve done in groups and I loved how they took so much care in the setup of the exercise as if it were a real piece. Thank you for that guys, your motivation is my best reward! I’ll go back to this workshops next week as soon as they’re all done. 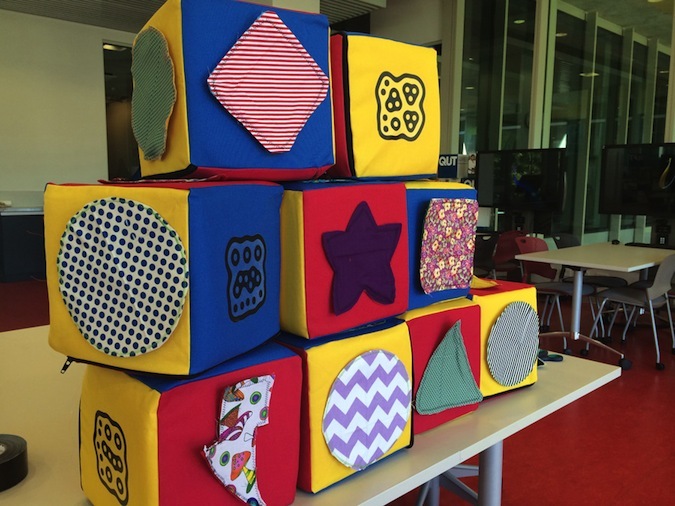 The Cube Artist-in-Residence Mónica Rikić shares her impressions about the Makey Makey workshop for the JumpstART program at Kelvin Grove State College. 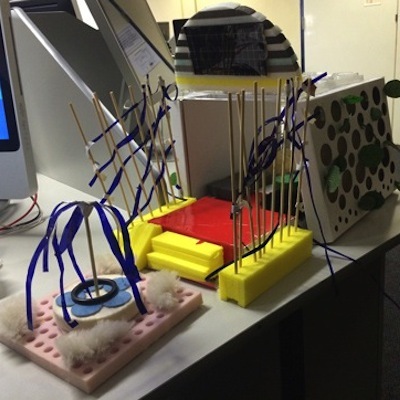 Mónica: This week I did a Makey Makey workshop for grade 7 kids in The Cube’s JumpstART program. This was the second group – I held the first workshop last week. They’ve been working on building these amazing community centres in art class out of recycled materials. It’s impressive to see what their imagination can lead them to build: eco-friendly buildings, shared spaces for children and grandparents, animal buildings and even a huge speaker building to be able to talk to the universe. First they had to list different sounds and interactions the building could have and a welcome message that they’d record and play when some part of the building was touched. The interactions and the sounds should be related to the concept of the building. I taught them how to use the Makey Makey with Soundplant to fire the sounds, and Audacity to record them previously when needed. I gave them just a quick look, and in two more minutes they got it! Even though the first day we had less time to work with the group, because we had to do an overall introduction to all of them at the beginning, they were VERY good. The kids came up with these cool interactions and funny sounds. The best part is to hear them explain their work. The second day group had the first day to prepare and more time to do it, but funny enough some of them didn’t finish all of their sound interaction hahahah 🙂 It seems that when you are in a rush you get things done quicker than having more time to think and then some indecisions appear! Nice team work and beautiful interactions too. So they were all BRILLIANT and I’m very happy I’ve had the opportunity to share this experience with Australian school kids and teachers. Thanks to The Cube for this opportunity and looking forward to working with them soon again and learning from their view of the future communities. Well done to all of them! 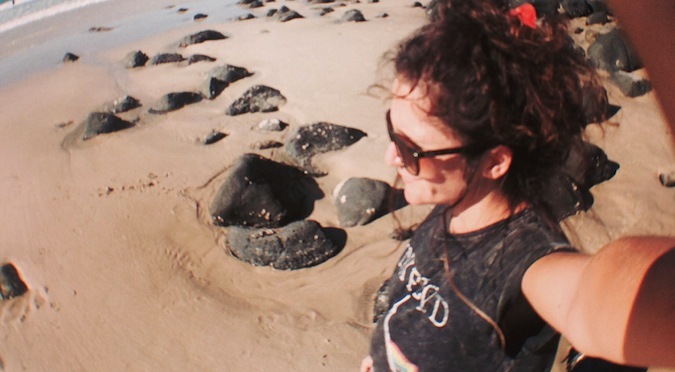 After a week of residency and a fun day at the beach with some friends, Mónica Rikić is feeling more than ready to start talking about the first steps of her project. Last week was a bit intense since I had to put my head into the project and get used to the new working environment. I also had my first JumpstArt program workshop, and even though I’ve done many similar workshops back home it’s never the same to deal with school kids from another country! 🙂 It went really well and this week we’ll be doing the second group of children of the same program and I’m really looking forward to it. So, about Buildacode, I can say that I’ve started to make some decisions about how the first stage of development will be. I’ve been working mainly in building MIDI sounds for the moment and messing around with the TUIO emulator to be able to decide the rest of the materials for The Cube – reacTIVision transfers and other drawings. Now I’ve got the code ready to be able to create different notes of a piano and play it either by activating the sounds with another cube or by building a metronome. I’m also able to change the instrument, the velocity and the length of every sound separately so I’m having a good idea of how the MIDI part should be right now. I’ve also been messing around with waves: creating them, changing the pitch, the volume and deciding the interactions that will make all of these events happen. Looking good! I’m a bit obsessed with the idea of making it as intuitive as possible so for this first stage I’ve decided to keep it simple and restrict the possibilities of creation and interaction until I can have a first real test with the cubes and someone else playing to see how it goes to make the changes needed to make it easy to play. 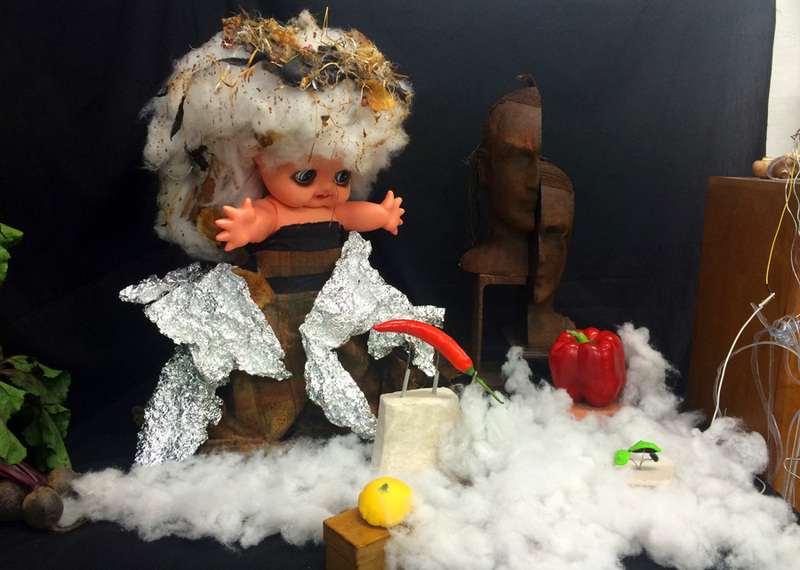 The Cube welcomes its newest Artist-in-Residence Mónica Rikić on her first day at The Cube! Mónica: So the time has arrived! After all the rush: finishing work, back home, some Australian holidays down in Northern Rivers and visiting some good friends in Sydney, it is time to start working! I made an ‘Australian wok paella’ last night so now I’m full of energy to face all the workshops I’ll be doing during the next 9 weeks and developing the project Buildacode. The first one is already next week. It’s part of a program called JumpstART for Year 7 students in Kelvin Grove State College and this year’s theme is Future communities, how can we contribute in a positive way to bettering or improving our communities?. The kids have already built ‘community centers/buildings’ made from recycled materials. 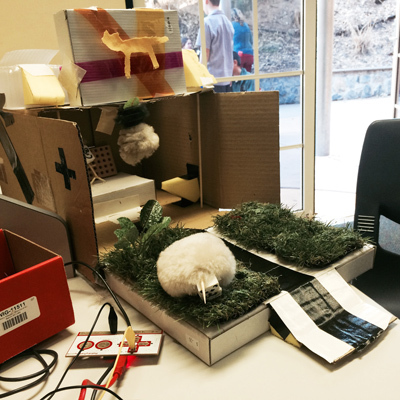 What we’ll do in the workshop is to take this ‘city’ one step further by adding sound to the buildings and making them interactive with Makey Makey. So this will be Wednesday next week 23 July and another one the next Wednesday 30 July. I’ll be posting some pictures in this blog and more info! 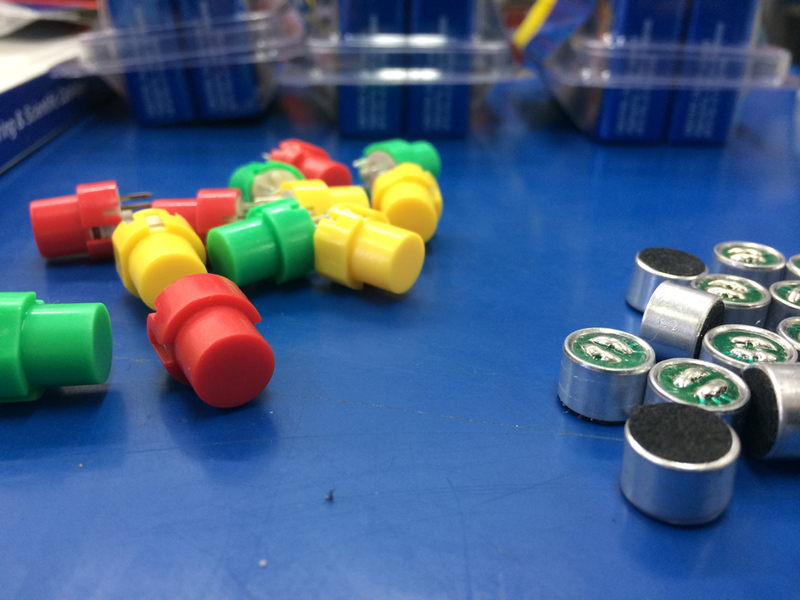 After this, the first three Mondays of August I’ll be doing another three Makey Makey introduction workshops, but this time for First Year Visual Arts students. I’m pretty excited about this since they’re not related to new technologies at all, I studied Fine Arts too and getting to know new tech changed my vision of art and became my media. So I hope I can open new ways of expression to some of them! The next one will be for the National Science Week. 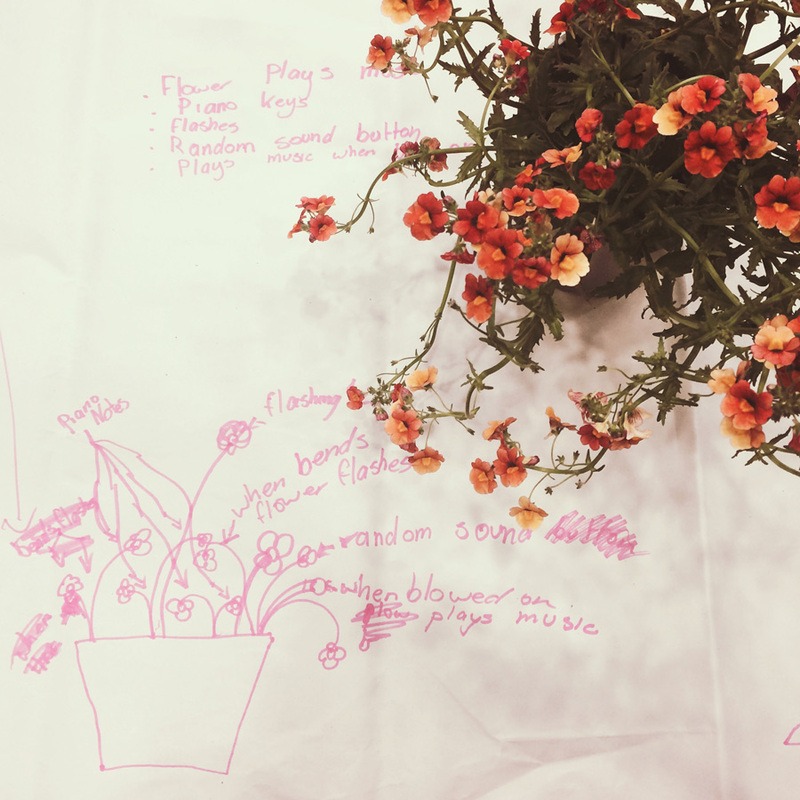 It’s going to be a pretty cool workshop I have to say… I can’t wait to see how it turns out 🙂 It’ll be a two day, four hour intensive Arduino introduction workshop for children where they’ll have to create a musical instrument from a plant – sounds nice doesn’t it? The idea was to make a Arduino workshop and making musical instruments out of plants sounded funnier than making the usual watering systems so we’re going for that! This will be 16-17 August and it’s open for anyone to enrol! More info coming soon. By this time we’ll be getting to the end of August and Buildacode should be quite advanced, so for my next activity which is a Masterclass for QUT students (27 August & 3 September) about using new tech in education, I’ll be introducing the project. It’ll be a two-session Masterclass. The first one will be more theorical and in the second one we’ll be working with Buildacode to create a common education mini-project with it. And last but not least, on 30 August I’ll be doing an Interactive Puppetry workshop for the Young Scholars program. It’ll be a three-hour workshop where they’ll have to create their own puppet from a sock and add some little electronic tricks to make it interactive. It’ll all be up to their imagination! 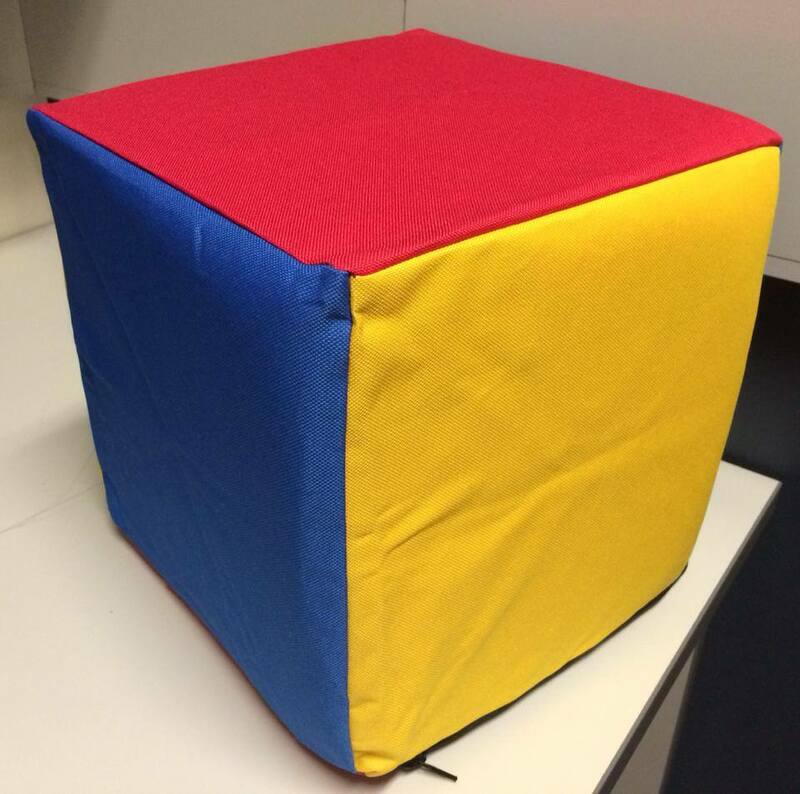 As soon as I arrived to The Cube I wanted to see the cubes – yes, everything is very ‘cubical’ – that I’ll use for creating Buildacode which they told me have arrived.